Yesterday evening it was dark by 10 to 7pm. Neil went down to shut away the hens and came back in a tearing hurry shouting my name. 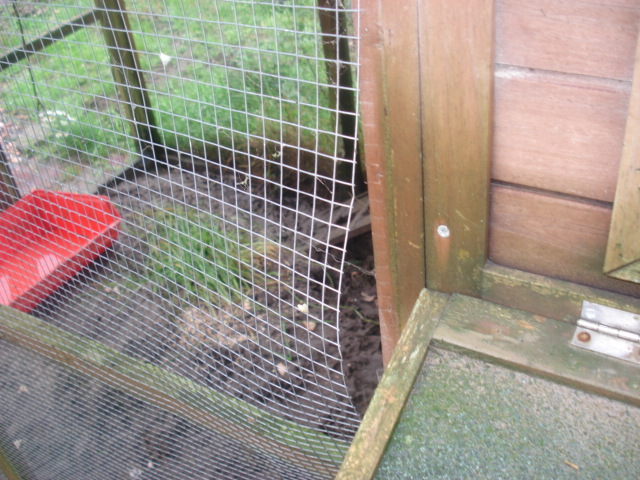 “There’s a dog in the hen house and it’s killed one of our chicks” he cried out to me. I couldn’t believe it. How could a dog get into the hen house? A couple of hours earlier I had seen our neighbour who has 4 dogs, ( a basset hound, 2 beagles and a great dane), and she was worried because she had lost her dogs. She had let them off the lead in her garden and they had got out and she couldn’t find them straight away. So over 2 hours had passed when Neil found one of her dogs, the 2 year old great dane, in our hen house. This dog, although muzzled, had pulled at the wire mesh on the side of the run to the hen house and managed to actually get inside the run. 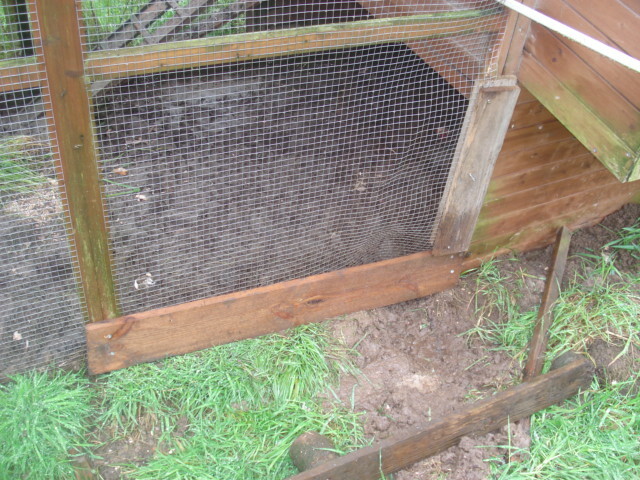 This was where we were keeping our 3 little chicks that we had hatched from eggs, separate from the rest of the adult hens. We were thinking they were nice and safe in there, and we had separated them because they were smaller and on different food from the adult hens. Neil had to go down there in the dark after dinner and make some running repairs to the hen run, other wise we would not be able to let the hens out in the morning. When Neil went down to the hens to shut the doors for the night, he could only see 2 of the 3 little hens and this great dane was still in the hen run and growling at him. It’s a big dog to encounter in the dark, and he was shocked and surprised to find it there. I managed to get hold of our neighbour on her mobile phone and she came round, but the dog had headed off leaving our 2 remaining chicks cowering in the nest box. I was concerned they would die of shock. The third chick, the little brown one was nowhere to be seen. Neil searched all round for it, in case it had got out when the dog got in, but then he made a grim discovery. Bits of chicken were trampled into the mud. The third chicken had been savagely torn apart by the great dane. 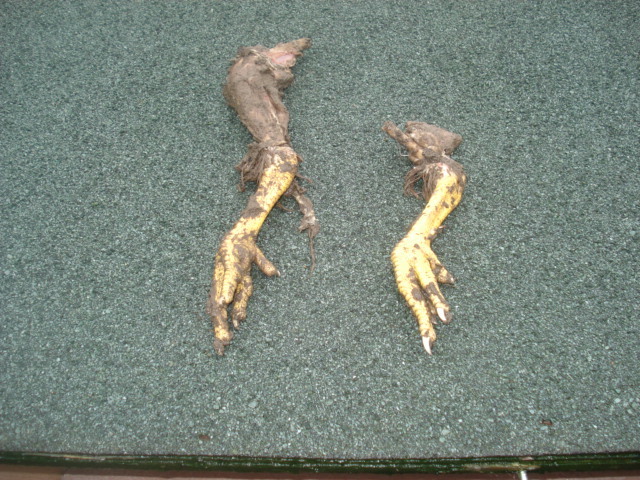 Warning the next picture is a bit grim, but this was about all that was left of the chicken, 2 legs!! Naturally we were horrified by this attack on a defenceless poor chick, and more so because these were the first chicks we had ever raised from eggs and we had nutured them and looked after them from day one, so to lose one in this way was very upsetting. Our neighbour was more worried about her dog and said “its only a chicken”, which may well be the case, but it was one of our babies and we hated the thought of it being ripped apart by her dog. A big dog like that which has not been to any obedience training classes, should not be let loose in a garden unless there is proper fencing to stop it getting out. Luckily the other 2 babies have survived the shock, and although quiet today, have been eating. The adult chickens were not harmed as they were behind an electric fence, but we had thought the little chicks were safe in their enclosed run, but we could not have foreseen this dog attack.